Some of my collection of traditional studio lens angle templates. The ones on the left are for long lenses while the ones on the right are wide-angle lens. The third from the left is a zoom lens template. Before the term “Pre-visualization” ever existed, there was the lens angle template. 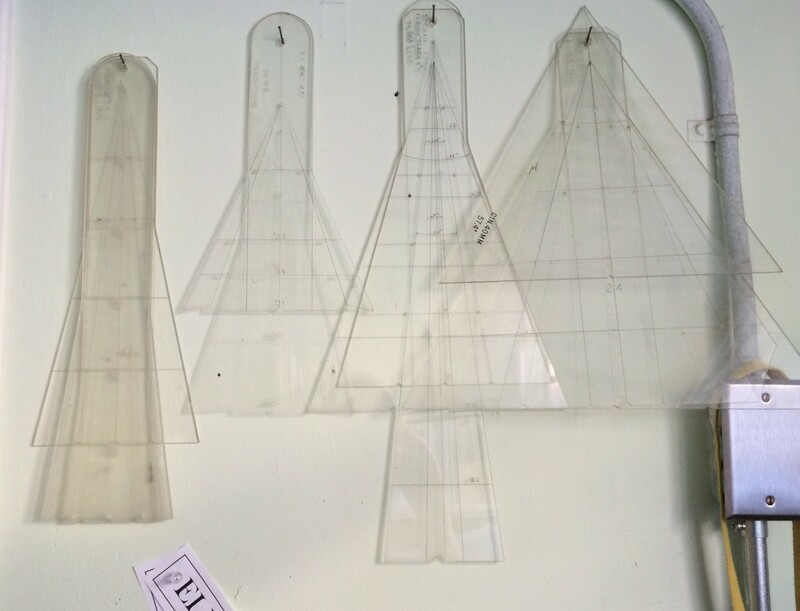 These were a staple of any Hollywood studio Art Department and were used when laying out a set to determine camera angles, backing sizes needed, rear projection screens and planning back-projected set illustrations for the producer and director to approve sets long before there were 3D computer programs. There was a time when a basic knowledge of optics and lenses was considered mandatory and was necessary not only because the Art Director would design the sets to be shot in a specific way but this information was needed when designing effects shots such as forced perspective sets, glass shots and the like. A template for a 100mm to 300mm zoom lens in the Todd AO format. Todd AO was an early 70mm film format with an aspect ratio of 2.20. 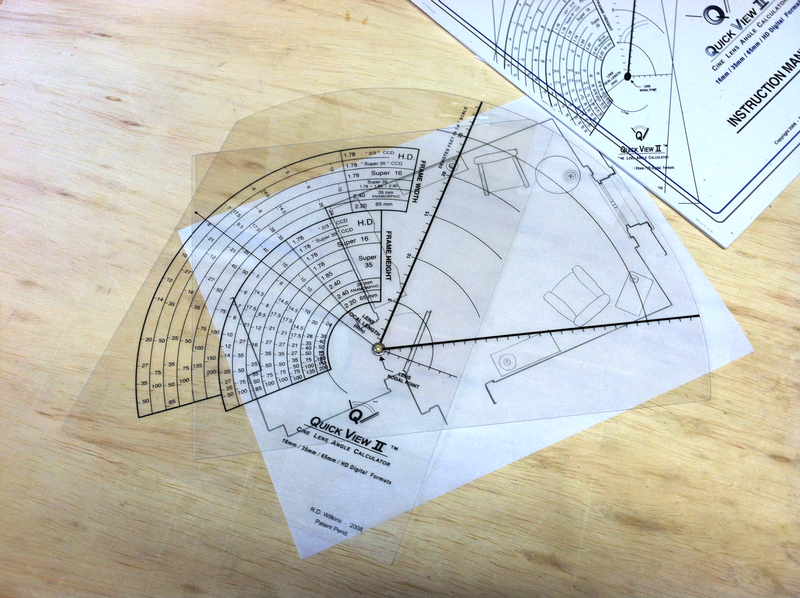 The templates were for a single lens, usually a prime lens, and were made using 1/8″ or 1/4″ thick plexiglas. The projection lines were scratched or engraved into the acrylic, sometimes by a Set Designer but other times they were made by the studio sign shop. Some of my examples are obviously done with a hand held engraving tool while others have been done with a lettering template and have inked letters. 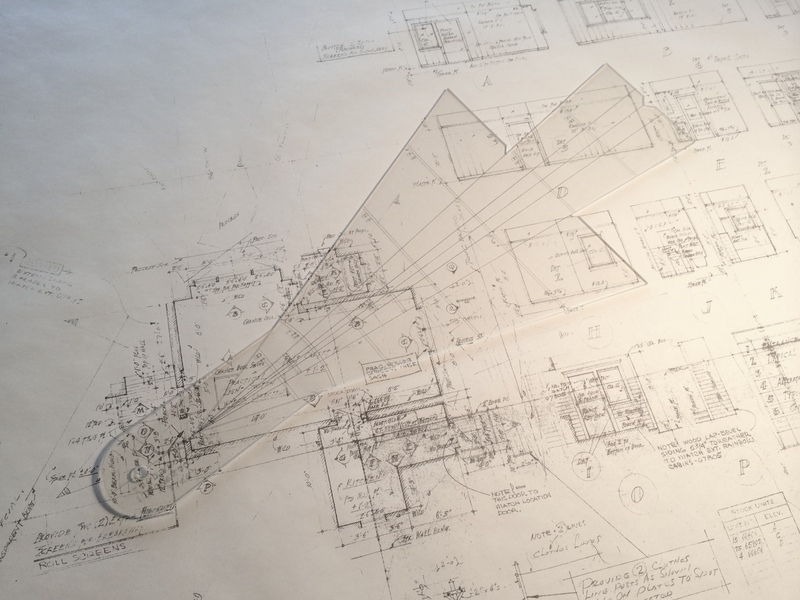 Each template had two sets of projection lines, one set for the horizontal plane (for use with a plan view) and another for the vertical plane, for use with scale room elevations. 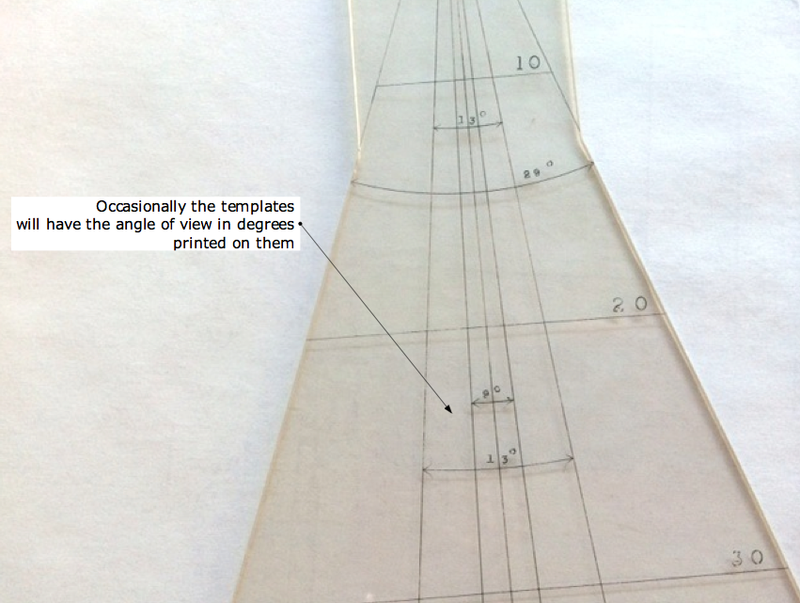 Most are made for use with 1/4″ scale drawings but they are accurate for any orthographic drawing because the angle is unaffected by the scale. 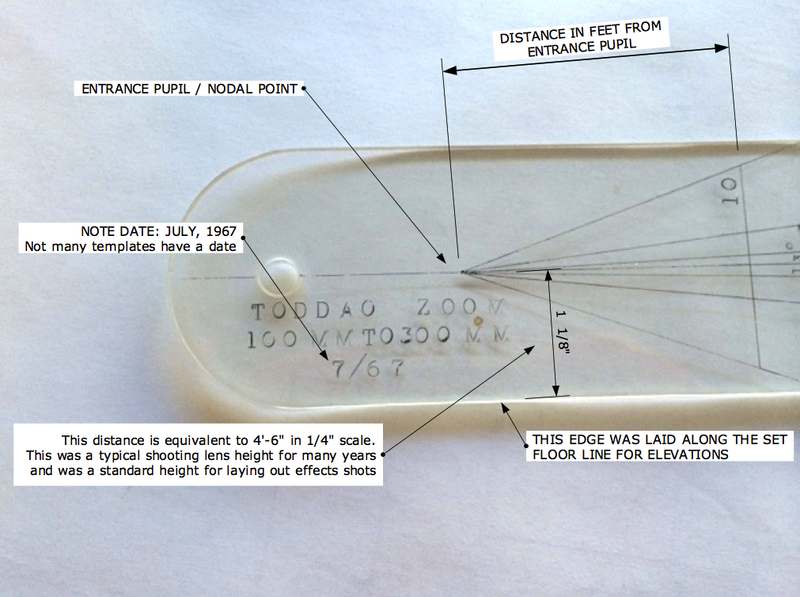 Most will have markings to note the distances from the lens entrance pupil in 1/4″ scale. By the 1990’s, there were so many different formats and lens combinations most of us in the Art Department in Hollywood carried thick manila envelopes of acetates of the various focal lengths, but I always seemed to be missing one that I needed and I found some were inaccurate from being cloned so many times. In 1998 I designed a device that had all the available formats and prime lenses so you could just dial up the one you needed. I redesigned it in 2008 to include the digital formats but sold out of them a year ago. I stopped having them made since they were expensive but hated to see them become obsolete since they are still so useful. For a director, they are the perfect way to see if a shot is possible at a location or see the limitations of a particular lens on a set when you can’t rely on wild walls. Yours won’t be on Lexan like the originals were but will be sturdy enough plus cheap enough to replace if it’s damaged or lost. Download the files below and take them to your nearest copy center and have both the dial and the nomen printed on clear acetate. They don’t have to be printed at exactly 100% but they should be at the same scale to each other. Then you just line up the center marks and use a compass point or push pin to pierce the centers, creating a pivot point in place of the brass rivet as in the photo above. The diagrams from the original instruction manual will explain how to use them. You’ll note that I’ve added a feature that wasn’t on the originals, a protractor which will tell you the angle of a selected lens. In the Sketchup™ Camera Tools seminar this past weekend I talked about the current trend in digital cameras and how they relate in using camera lens angles to view 3D models and illustrations. A camera that is creating a great deal of excitement in the camera world, and a lot of confusion in Art Departments, is the RED camera. 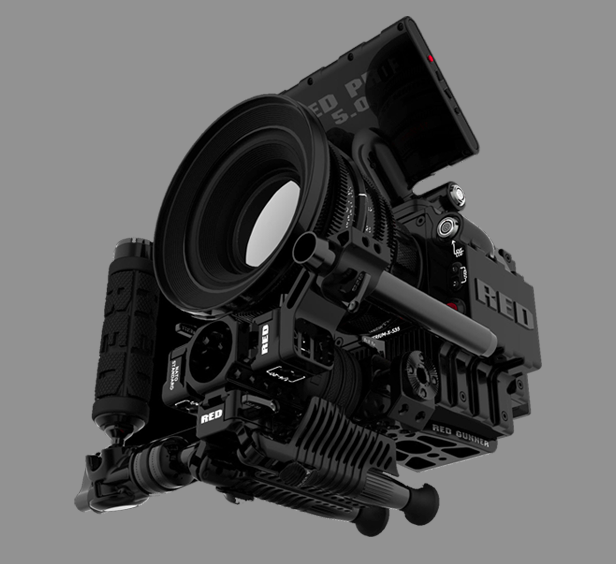 Just over three years ago the Red Digital Cinema Camera Company entered the market with what they called a DSMC system, or Digital Still and Motion camera system. The camera was basically a component system with the body, or brain, containing the sensor and the other various components needed to record an image. The system was designed to be configured and upgraded as the user saw best to fit their work needs. The design of a camera with dual capabilities would fuel the current trend of high-end still cameras which also record HD video, but that’s getting ahead of ourselves. Designed with a 35mm sized chip, the camera is able to record video with the same depth of field as 35mm as well as having similar focal lengths, allowing for the use of existing lenses from other camera and 35mm systems. The system allows the user to record in four different formats: 4.5k, 4k, 3k, and 2k and each of these can be framed or extracted in different aspect ratios. With the new Epic, whose sensor is 5k (5000 pixels across), the choices are 5k, 4.5k, 4k, 3k, 2k, 1080p, and 720p. At this point your eyes are probably crossing and you’re saying, “so what?” Basically, what you need to know is that each successive format is a smaller cropped version of the previous one. In Super 35mm, the frame, or negative is cropped according to the aspect ratio for the release. The difference is, the cropping only occurs vertically. 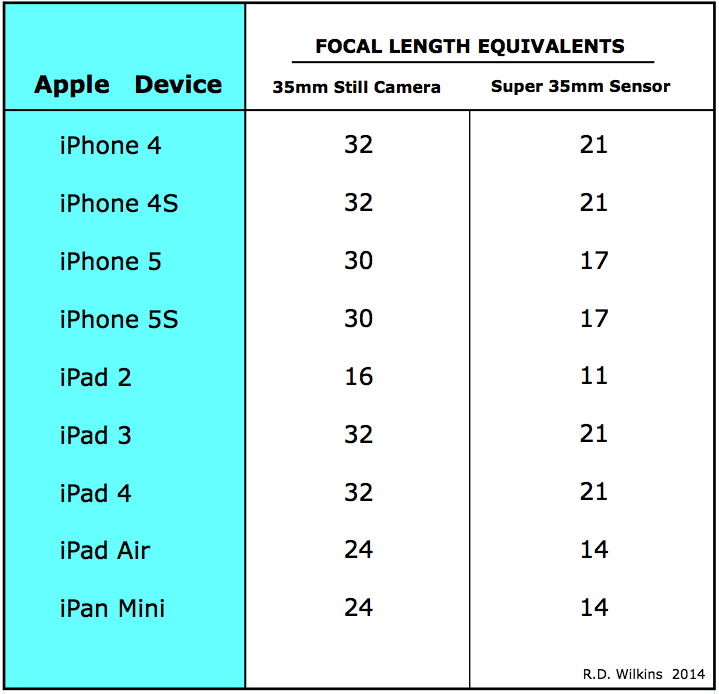 The width of all the formats is (nearly) the same, so that a lens focal length will be similar in each of them. Here is a diagram explaining the Super 35mm format from an article comparing digital and film formats that I wrote for theAug-Sept. 2010 issue of Perspective Magazine. With RED, each format will have a narrower horizontal field of view than the previous one. 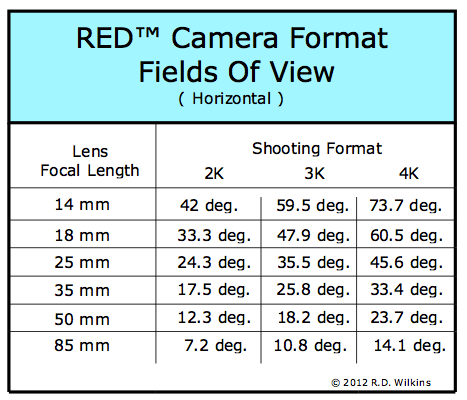 Meaning that a 50mm lens in in 3k will have a much narrower field of view than it does shooting in full sensor 5k. 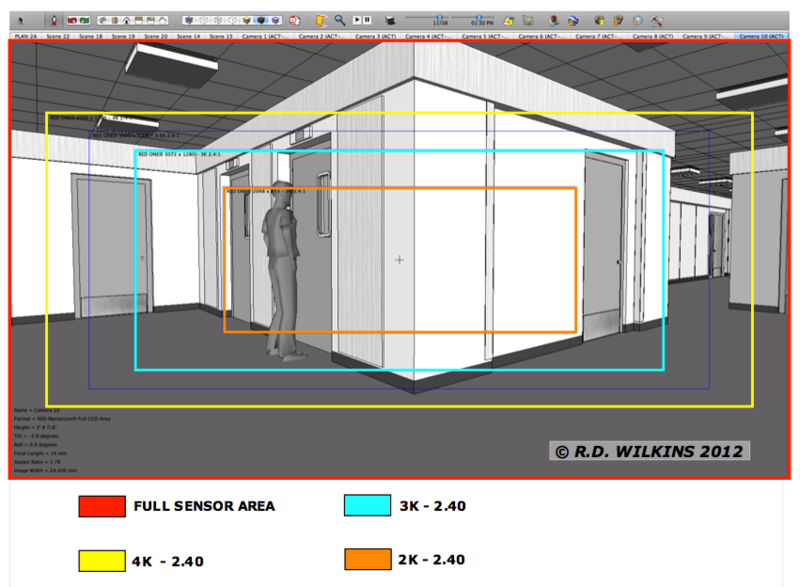 Below is a viewport in Sketchup™ set up using the Advanced Camera Tool pluging. The “camera” is set up for the full sensor option with the safe areas turned on for the other formats. In this screen shot of a model viewed with a 14mm lens, you can see how each progressively smaller ‘k’ format crops the sensor and has a narrower angle of view with the same lens. So, when you are setting up a model to view from a specific position with a particular lens, it’s important to know at what ‘k’ is the set going to be shot. Click on the image to enlarge it on your screen. 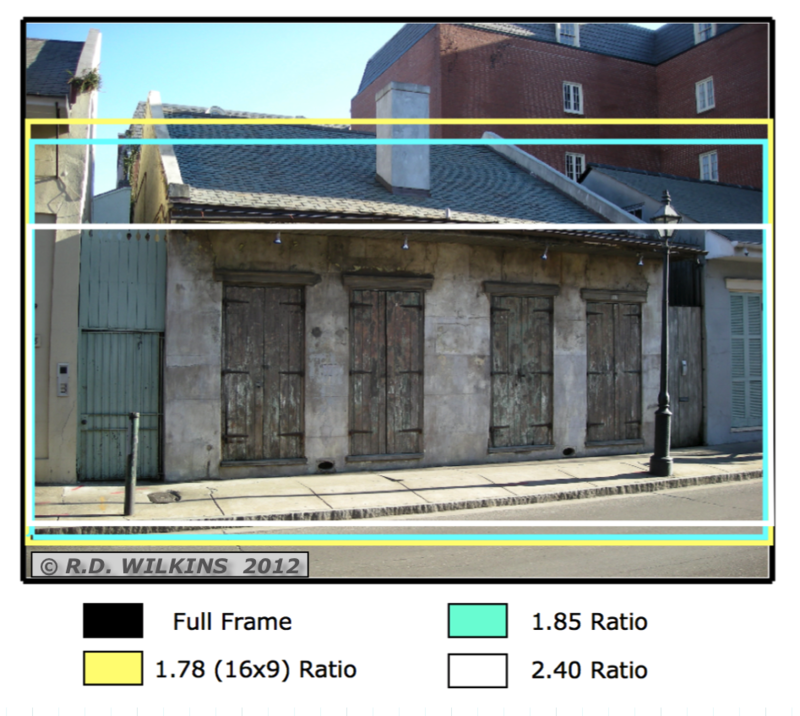 Here is a chart that breaks down the horizontal angle of views depending on which format the film is going to be shot in. The lenses listed are generic focal lengths and do not cover the entire range of lenses available. But, this should give you an idea of the proportional change in the horizontal angle of the captured frame based on the different shooting formats.